The Concordia Student Union’s 2017 by-elections are here. From Tuesday to Thursday, Concordia’s 35,000 undergraduate students will be asked to vote on the following referendum questions. Polling stations will be set up on both the downtown and Loyola campuses, with some in the Hall, EV, LB, VA and MB buildings, and the SP, CJ, and Vanier library buildings, respectively. Quorum for the election 450 votes. Here’s an overview of what you’ll find on the ballot. Do you as a CSU member agree with amending special by-law I such that any expense above $250,000 for the use of student space (including purchase, renovation, lease) must be approved or mandated by referendum? The CSU’s Special Bylaw I details the Student Space, Accessible Education and Legal Contingency Fund, how it collects its fee-levy, and how it’s used. Since 2005, the SSAELC fund has been collecting a $1 fee-levy per credit. It now holds over nine million dollars. The amendment would restrict the CSU’s ability to spend more than $250,000 without asking the students during elections via a referendum question. The amendment comes in response to the CSU’s attempt to purchase the building that formerly housed Burritoville on Bishop St. CSU council shot down the motion to purchase the building, which was listed at $1.65 million. CSU council has approved the use of the SSAELC fund, without referendum, but it was never for anything more than $200,000 according to CSU councillor Rowan Gaudet. The $250,000 limit also gives the CSU some flexibility in case they want to use the SSAELC fund for smaller projects, he added. In past elections the CSU has used referendum questions to approve the use of the SSAELC fund for million dollar projects to renovate Reggie’s, the Hive Café, and to jumpstart the student housing project with the Unité de travail pour l’implémentation de logement étudiant. Do you agree to increase the fee levy of the Concordia Food Coalition by $0.08 per credit to a total of $0.16 per credit, effective Winter 2018? 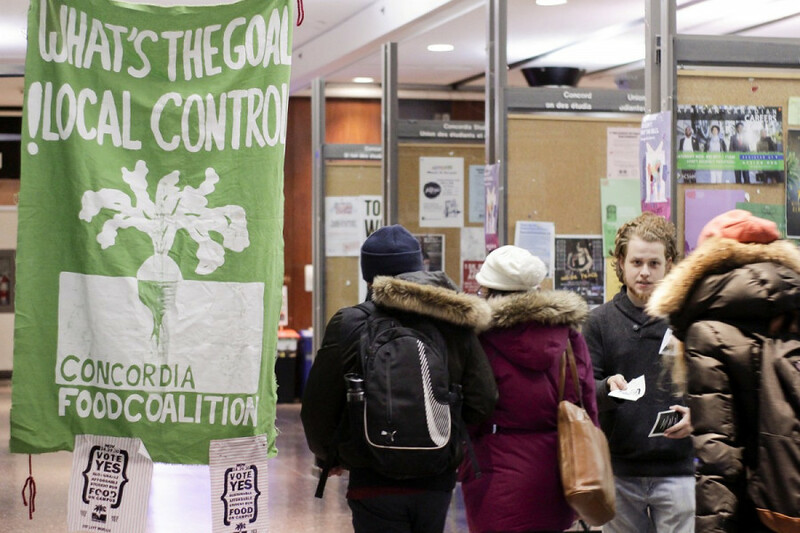 The Concordia Food Coalition wants to double its fee-levy, to a total of 16 cents per credit per undergraduate student. The CFC’s finance coordinator, Andrea Reichert, explained that doing so would allow them to expand the services they currently offer. This would allow the group to continue towards their goal of reducing food insecurity on campus, said Internal Coordinator Sebastián Di Poi said at an October CSU meeting. With the increase in fees, Di Poi said one of the things they’d like to do would be to expand the Mother Hubbard’s Cupboard program, which currently operates out of the Concordia’s Multi-faith and Spirituality Centre. Mother Hubbard’s Cupboard serves vegan dinners every Thursday for $2, or pay what you can. With the increase in revenue, the CFC would like to expand the program to every weeknight. The increase in fee-levy funds would also allow the CFC to become less reliant on grant money, Reichert explained. Last year, she said the amount of money they made from student fees totaled around $56,000, while they obtained about $27,000 in grant funding. Certain programs in Concordia University, such as Applied Human Sciences, Education, and Art Education, have obligatory internships with the condition that they be unpaid. Are you, as a Concordia undergraduate student, in favour of Concordia University removing the requirement that these internships be unpaid? In some of Concordia’s programs, students can only take on unpaid internships for credit, and some students need to do unpaid internships to graduate—as is the case for those in education. Other students can credit for their internships regardless of whether their internships or paid or not. The CSU wants to see an end to that. Their campaign for the year is to lay down the groundwork to ensure that, in the future, all for-credit internships at Concordia are paid. Given the financial burden that comes with taking on unpaid internships, Asma Mushtaq, their academic and advocacy coordinator, and their mobilization coordinator Ahmed Badr, saw it as a serious issue, and that’s why the two are leading the campaign. Are you, as a Concordia undergraduate student, in favour of Concordia University establishing a standardized system and placement protocol for all student internships? There’s currently no centralized body in place to oversee all the for-credit internships at Concordia. As a result, it’s hard for the school to track if all students are getting the chance to take on internships of the same caliber. Mushtaq has noticed that some programs issue out surveys to their students after they end their internships, whereas others don’t. When asked about this, Nadia Bhuiyan, vice-provost of experiential learning, said that internship directors at Concordia are currently in discussions to ensure a body like that will be in place within the next two years. Are you, as a Concordia undergraduate student, in favour of the Concordia Student Union adding the following positions to the CSU Positions Book? That the CSU recognizes that systemic racism differs from individual acts of racism by the presence of systemic policies, practices and economic and political structures which place minority racial and ethnic groups at a relative disadvantage. Upon discussing the placement of posters and stickers from far-right groups in the school at a recent council meeting, council came to the realization that the CSU does not explicitly have a position against racism in their positions book. Feeling it is necessary with the rise of these groups, they chose to bring this to referendum. “If we have a position like this, we can tell them students voted for this. […] It’s telling people […] we don’t tolerate this and we have a position coming from students at large and we can’t tolerate hate messages and far-right, racist groups,” CSU External Affairs and Mobilization Coordinator Ahmed Badr explained. Bill 62, which requires people in Quebec who wear the niqab, burka or other face-covering to uncover their faces when they give or receive any public service, including public education, health-care and public transit, was adopted into law on October 19, 2017. This legislation also allows public institutions to refuse religious accommodation, such as taking a day off school to celebrate a religious holiday. Are you, as a Concordia undergraduate student, in favour of Concordia University refusing to enforce this law and to support students, staff and faculty who choose to practice their right to religious freedom? The purpose of this referendum question is to ensure that students who are affected by Bill 62 are protected, Badr explained. “If they will apply [this bill] to women who cover their faces, one of the places affected is universities and libraries because they are funded by the provincial government so we don’t need to see security [policing everyone] and saying who can get access to certain services,” Badr said. While the CSU had already taken a position against the bill, Badr explained that if the referendum question goes through, it shows that the majority of Concordia students at large are willing to unite against this law and protect the religious freedom of their peers. “It’s important to being it referendum because […] it gives a clear message that the majority of Concordia students reject this law, it’s not only limited to council or CSU,” Badr added.